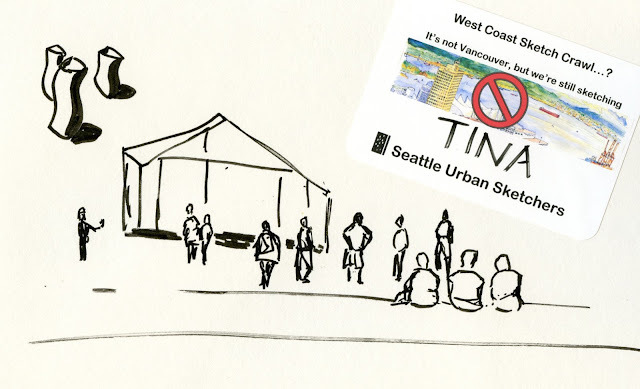 Urban Sketchers Seattle: Mega Pity Party Weekend! When we heard that the 5th Annual West Coast Sketch Crawl in Vancouver, B.C., had been cancelled, many of us in Seattle were very disappointed. 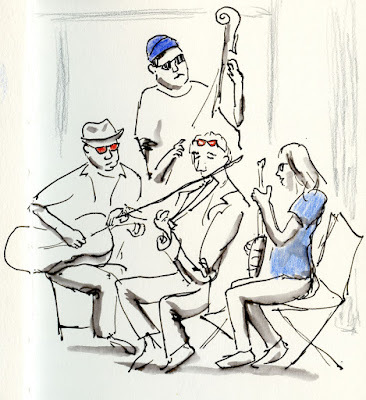 I had a great time in Tacoma last year and in San Diego the year before, and I had been looking forward to another terrific long weekend of sketching in that lovely Canadian city to the north. 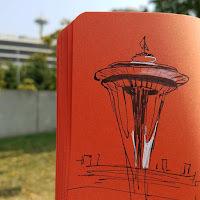 The USk Seattle admin team decided that we weren’t going to cry over lost sketching. For the same weekend that would have been the Sketch Crawl, we scheduled an extravaganza of outings on Friday, Saturday and Sunday. Not intended to be a formal replacement for the cancelled event, it was just a way to give everyone as many sketch outing options as possible as we move toward the waning days of summer. 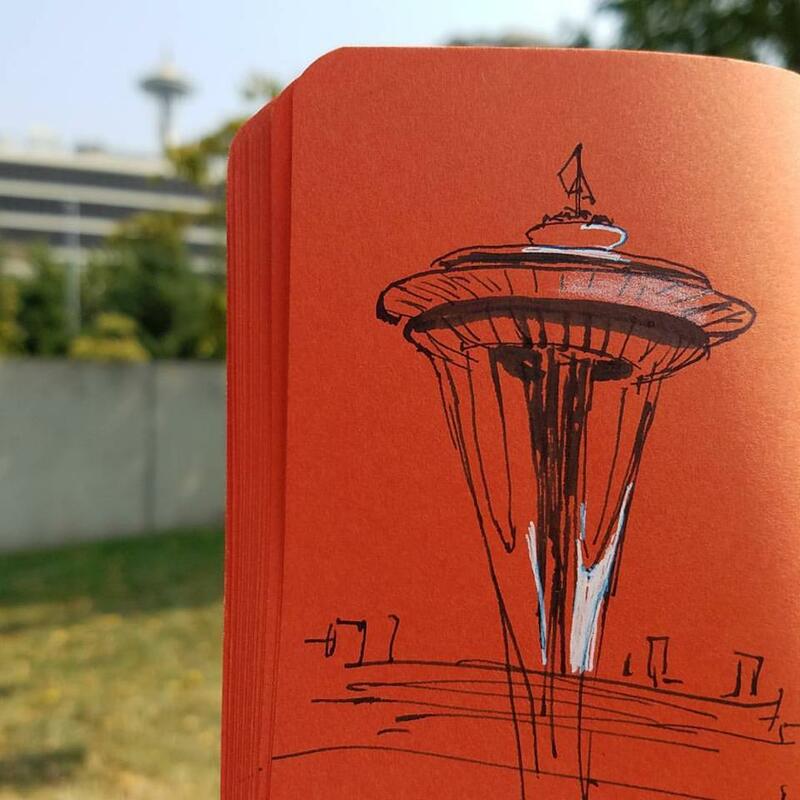 On Friday we met at the Olympic Sculpture Park, which has become something of a summertime staple. 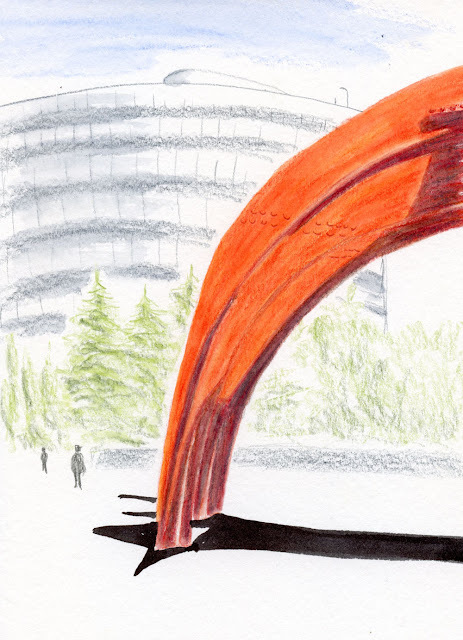 Although I sketch Calder’s Eagle just about every time I visit (last year, twice in 2014 and in 2013), I was magnetically drawn to it yet again. This time, however, I chose a partial view, and as I sketched, I remembered fondly Calder’s similar but much larger Flamingo in Chicago. I wandered around the park a long time, simply enjoying the not-too-hot sunshine and not feeling particularly compelled – until I saw the Space Needle peeking over some buildings. 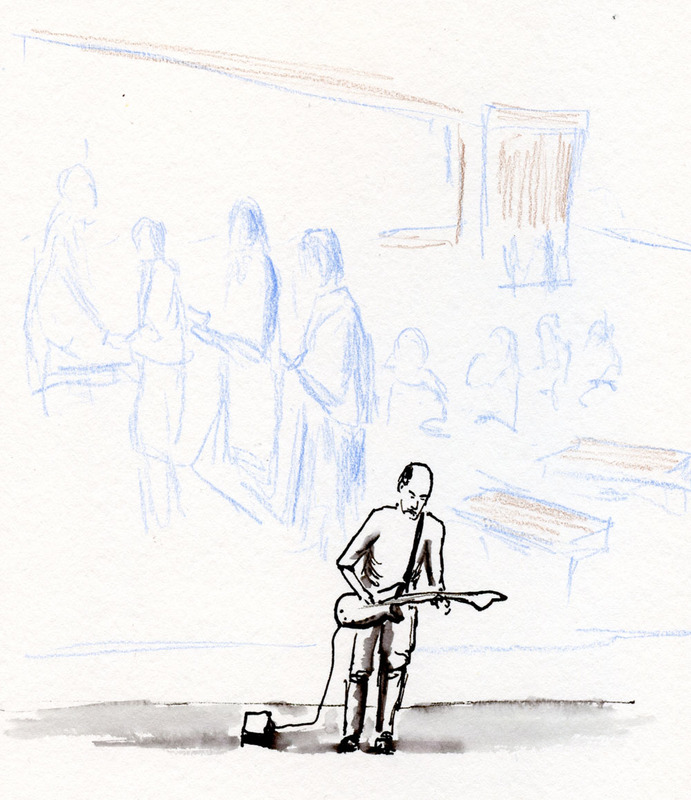 Then with only a few minutes before the throwdown, I made a quick sketch above the amphitheater with Richard Serra’s Wake in the background. The empty space on the page was a good spot to hold the badge that Kate had playfully given to participants. 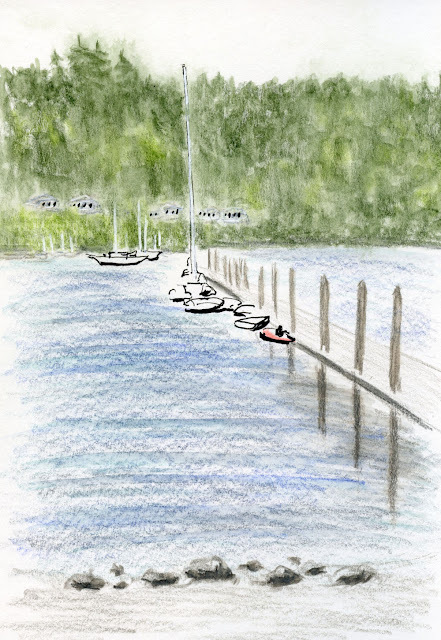 For Saturday, Day 2 of our extravaganza, we chose Bainbridge Island for an entire day of sketching. 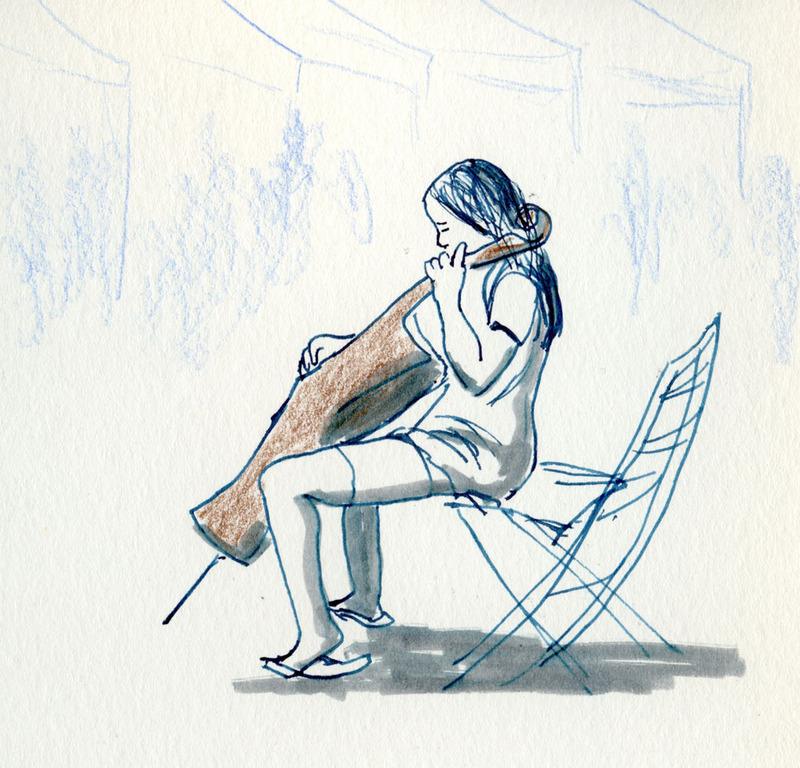 Meeting up on the ferry, most of us started sketching right away, and I spotted a woman I didn’t know who looked like she was sketching, too. When we talked to her later, it turned out Martha was aware of Urban Sketchers but didn’t know we would be on the ferry that day. 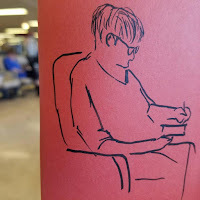 A life drawing student, she simply enjoys sketching people on the ferry. 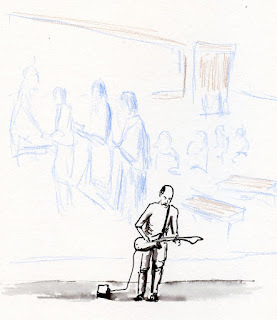 Imagine meeting a sketcher in the wild who isn’t part of Urban Sketchers while we’re on our way to a sketch outing! After the initial meetup in Winslow, I headed for the Bainbridge Farmers Market, where I was lured by music and the smells of good foods cooking. I had to leave the house so early to catch the ferry that I had skipped breakfast, so I ate a big piece of carrot cake while sketching Good Karma Blues, a lively band with a terrific vocalist. That was a lot of fun, and I could have stayed all day sketching nothing but the market, but I was on an island, after all, so I found myself gravitating toward the water. At Eagle Harbor, the sun started to break through the overcast sky as a few lazy boats knocked against a pier. 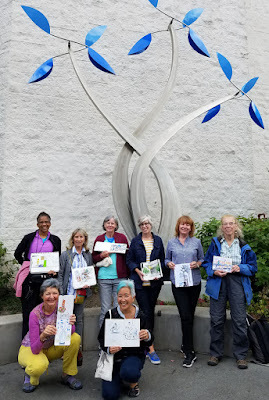 After the sketchbook throwdown, the group split up – some going to Rolling Bay to take part in the art studio tour and some staying in Winslow for lunch and whatever. I opted for the latter, and after a leisurely lunch of symposium gossip, half the afternoon zipped by on island time. A few of us went to the Bainbridge Island Museum of Art, where local artist Bill Hemp has an exhibit of pen and ink drawings of island locations. Interestingly, the pieces are reproductions of his sketchbook pages that look like they are torn right out of a spiral-bound book. 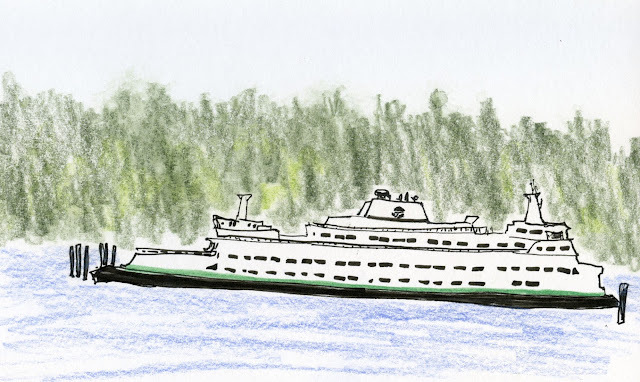 While I often have opportunities to sketch ferries, I see them only when they are either stopped briefly at a dock or a long distance away where it’s hard to see details. I took advantage of a moored ferry near the Winslow terminal to squeeze in one last sketch before hopping on the ferry back to Seattle. I think being able to take my time to observe and draw all the details on this one will help me fake it a little more realistically next time I need to sketch a ferry on the fly. 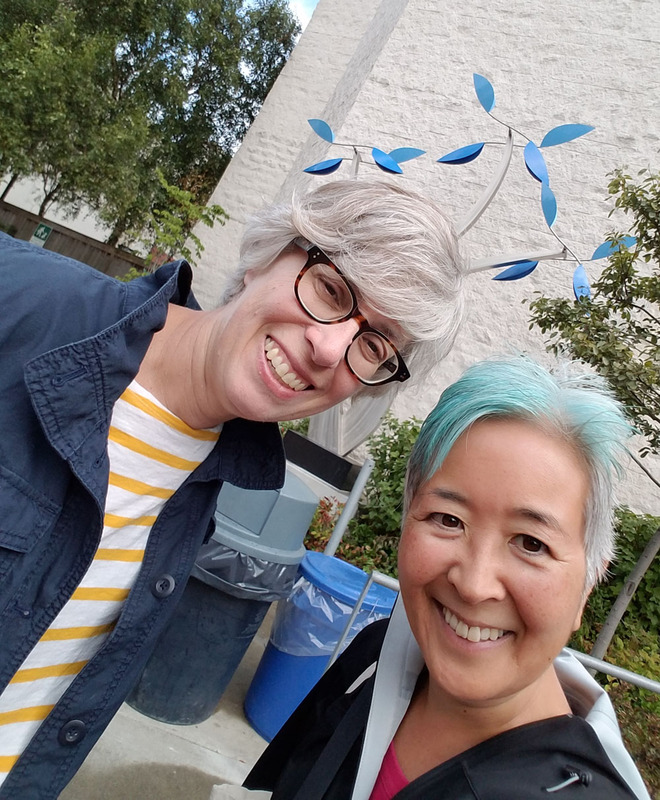 For our third and final day, we chose the West Seattle Farmers Market, one of Seattle’s few neighborhood markets that are open all year round. As I was driving across the West Seattle Bridge, the drizzle on my windshield started looking like it could be “measurable” rain, which made me wonder if we had finally ended our record-breaking spell of consecutive dry days. I also started wondering if our sketch outing would end in a soggy mess. As it turned out, we did end our dry streak with 56 consecutive rainless days, but I needn’t have worried about sogginess – the measurable drizzle stopped as quickly as it had begun, and it was my favorite sketching weather – a comfortable temperature, not windy, the sun darting in and out of clouds just often enough to provide shadows or light, whichever you need at the moment. 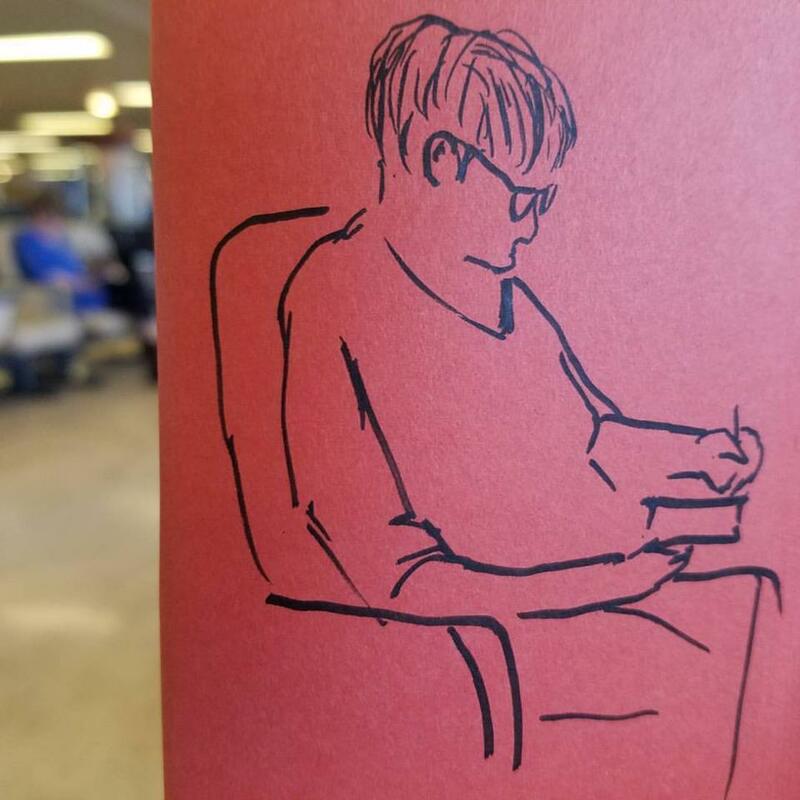 I hardly sketched any people in Chicago, so today I made up for it. A lively bluegrass band, a young cellist, and a guitarist standing in front of a huge mural all provided the tunes for a fun morning at the farmers market. 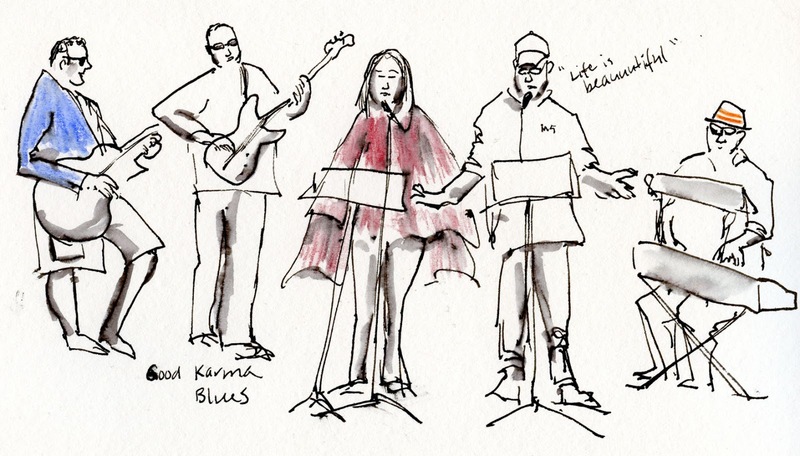 Despite the iffy weather, we had a small but stalwart turnout for our pity party finale. And Sue and I get the prize (each other’s respect!) for participating on all three days! Sue and I made it to all three days!